Form 760C or the "Underpayment Of Virginia Estimated Tax By Individuals, Estates And Trusts" is a form issued by the Virginia Department of Taxation. 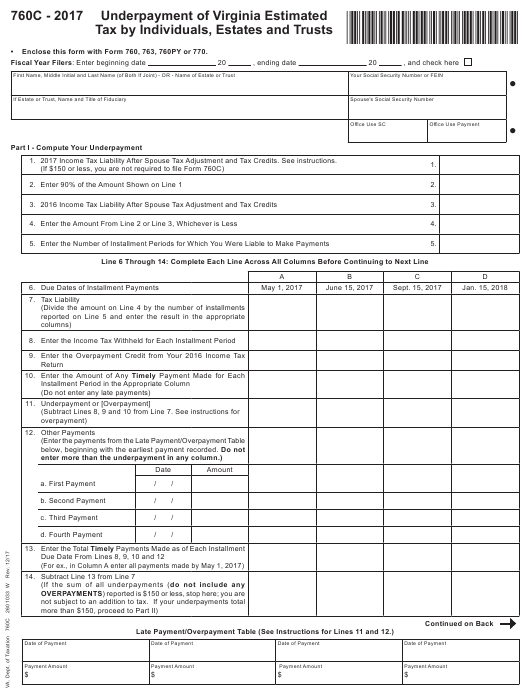 Download a fillable PDF version of the Form 760C down below or find it on the Virginia Department of Taxation Forms website. Enclose this form with Form 760, 763, 760PY or 770. 1. 2017 Income Tax Liability After Spouse Tax Adjustment and Tax Credits. See instructions. Multiply the actual amount for the period ended April 30, 2017, by 3. Multiply the actual amount for the period ended May 31, 2017, by 2.4. Multiply the actual amount for the period ended August 31, 2017, by 1.5.
number (1, 2, 3, or 4) on Line 20; skip Lines 21 through 23; and enter "0" on Line 24. For all other periods, complete each line as instructed below.